[For 2013 Only] Dreyer's / Edy's has ended their long term relationship with the Girl Scouts. Now granted they could still be donating proceeds to the girl scouts, but all the girl scout branding is gone from their ice cream containers (but that thin mint "flavor you love!" should still be here). 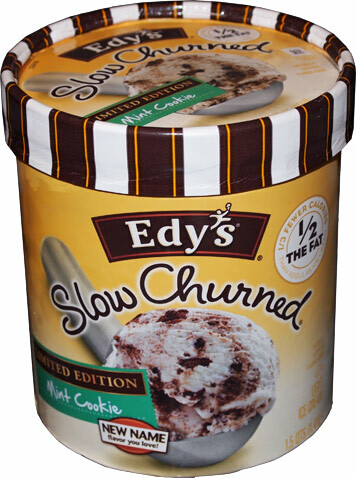 Now I dont' have an official description because, well, Edy's doesn't feel the need to provide us one on the container (nor does the website's limited edition flavors sections appear to be working in any of the major browsers). 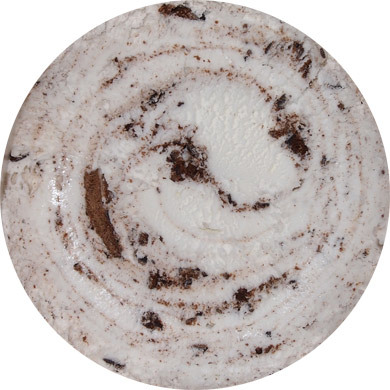 Oy, let's just chalk this one up to "generic thin mint cookies in mint ice cream". Visual first impression is good, no complaints. See, your beloved thin mint (looking) cookies are still here.... at least I think they are, I don't really have anything to compare it to at the moment.... Ok, let me start the thought train over again. 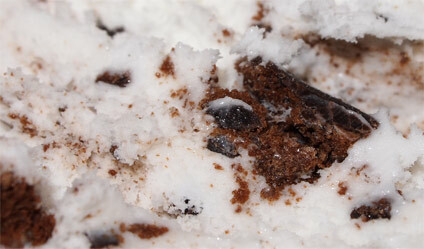 See, in my brain, I remember thin mints as being fairly crunchy and so I very much expected mint cookies and cream ice cream BUT as you can clearly see the cakey insides of these cookies have gone everywhere. See? The insides of the cookies have literally created cake crumb like swirls. It's certainly a visually appealing ice cream... but something isn't sitting quite right with me. Yes, I expected something different, but even when I try to shoo that from my brain, I just can't settle into this one. It almost tastes like I've smashed my beloved frozen kandy kakes into some mint ice cream (wait, you need to have tried frozen kandy kakes for that to make sense). Oh sure, mint fans will like this one, but I really need some grit to my ice cream. It's weird saying something is smooth when it's non-stop chomping. Oh I'm happy it's not gummy, but I'm not pleased either. See, the chocolate shell of the cookies has gone everywhere in terms of both taste and texture. So you constantly taste the chocolate shell as well as find fragments of the shells in your munching. Wow, I'm not making any sense am I? On Second Scoop: you know, the first scooping really threw me off my game last night, so let's try a long winded second scoop --- It's certainly a neat looking ice cream as it almost has the appearance of thin cake crumb swirls. Taking a big whiff, it certainly smells like thin mints. It's funny because you swear that it's almost got a very faint green hue to the base ice cream. Ok, too much talk, it's melting. Ok, first bite with an open mind. It certainly has that thin mint taste, though the direct translation to an ice cream can be a little disconcerting. I dont know if it's the effervescence or just some backing chemicals, but it sits weird in your mouth. It's like every single texture is present at the same time and it just feels a bit unnatural. I know I'm being picky, I always am, but sometimes different worlds come together and make a beautiful new thing, and then other times you just kind of scratch your head. I'm not going to pretend that the thin mint crowd won't love this, and with my new found appreciation of mint I really am trying to dig this, but it's just too cakey for me... ok, I really want to say that it comes across as a little slimy. The point is the texture just isn't working for me. You know what? I'm starting to wonder if this works better as a non-light ice cream. Yeah, that will be my recommendation. If you want to try it, go with the regular ice cream, not the slow churned version, and then come back and let us know what you think. I love the Samoas flavor icecream. Give it a try and see if it works better for you than the Thin Mint. there should be a review up of that in the very near future. We got the non-light version and even I liked it, been thinking about buying another container of it actually. 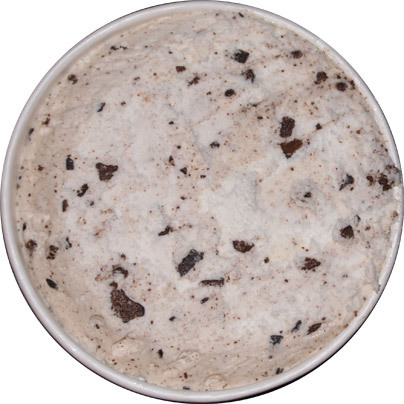 I am of the opinion that the cookie chunks in the ice cream do not taste the same. well they are definitely a generic alternative, but I just had a couple of thin mints and and do have a similar mild flavor like this ice cream does. Interesting.... I never knew that those were supposed to be Thin Mints. I've been eating all of this flavor I can get my hands on, it's my favorite! But I thought that the cookies were Oreos lol.